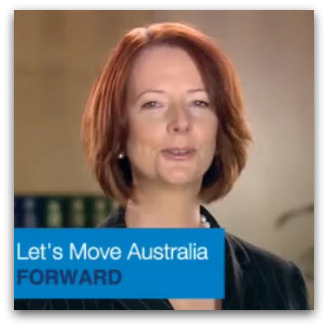 The Australian people are now deciding whether they want to 'move forward' with Julia Gillard or 'stand up for Australia and for real action' with Tony Abbott. In the mix is the divergent stand on the processing of unvisaed asylum seekers. The Rudd Government scrapped the Pacific Solution and temporary protection visas (TPVs), insisting that detention of asylum seekers would be a last resort with an assurance that health, security and identity checks would be complete within 90 days. The Opposition insists that these reforms put sugar on the table attracting asylum seekers to engage in secondary movement so as to obtain a more benign migration outcome. The Abbott led opposition would take the sugar off the table reinstating TPVs and the Pacific solution. Mind you, there is no evidence that TPVs reduced the attractivenes of Australia as a destination, given that boat arrivals increased the year after TPVs were first introduced. The initial deterrent effect of the Howard Pacific Solution was the pronouncement by the Prime Minister that proven refugees would not be allowed to settle in Australia. Most of them did eventually settle in Australia or New Zealand, being indifferent about which side of the Tasman ditch they ended up. There is a new common thread between the major parties. They are both open to the idea of a regional processing centre for asylum seekers who reach the region in direct flight from persecution in faraway places like Afghanistan, Iraq and Sri Lanka. Gillard, at pains to distinguish herself from her predecessor, has publicly floated the idea of a regional processing centre in East Timor. Given that Kevin Rudd refused point blank to discuss the matter with Jose Ramos Horta, President of East Timor, on his state visit to Canberra on Rudd's last day as Prime Minister, Gillard decided not only to raise the topic with him but to herald the conversation even before Australian officials had the opportunity to discuss the matter with the governments of East Timor and Indonesia. This was a move designed purely for domestic electoral consumption, taken with a reckless disregard for the niceties of international diplomacy. The Timorese are used to short term, half clever ideas from Australians when dealing with asylum seekers. Back in 2001, the Howard Government, wondering what to do with the 433 persons on board the Tampa, asked Horta and other Timorese leaders to take them, as a favour. The Timorese were minded to help out their big neighbour, in part as a gesture of thanks for all Australia had done for them. Sergio De Mello was head of the UN in Timor in those days. He had worked for UNHCR and insisted that such a move would be unprincipled. It was, and it did not happen. A regional processing centre may be a good idea. Its location in East Timor would be unprincipled and unworkable. Gillard's pre-emptive announcement will ensure that it will be anywhere but East Timor. Presuming the major political parties agree to these preconditions, the matter should now be put aside during the election campaign, allowing the new government of whichever persuasion to work through the detail of these preconditions. Health Minister Nicola Roxon rightly concedes there would be a need to consider the psychological health of people, including children, in such a facility. There would be a need to consider how the 90-day rule for processing might be fulfilled. When the Pacific Solution was in place, my own visa to visit Nauru at the request of the Church community there was cancelled peremptorily by the Nauruan government. Ruddock assured me he had not blackballed me but he 'could not speak for Alexander' (Downer). Access would need to be assured, even for do gooders! A true regional response to the issue would include the possibility that refugees could be resettled in any of the participating countries, including East Timor and Australia. When a detention centre was set up at Baxter, many local residents at Port Augusta complained that the detainees received better food and services than they did. Such complaints will be commonplace and even more justified in places like East Timor. If the centre were located in East Timor, the thousands of asylum seekers waiting in Java could simply ride the ferry to Kupang, travel overland through the porous East Timor land border and ask for residence in the regional processing centre, awaiting prompt resettlement in Australia or New Zealand. That would be a real honey pot. In principle there is nothing wrong with a regional processing centre. But its location and working principles await more mature consideration than Gillard gave in her Lowy Institute address. No matter who is elected to govern, they will readily appreciate Rudd's hesitation in raising the matter directly with Horta. This idea requires a lot of detailed diplomatic work behind the scenes. If Gillard is elected Prime Minister, it could be Rudd's first real test as Foreign Minister. Whoever is elected, and wherever such a centre is located, it will not be East Timor. To 'move forward' together and 'take real action' on this issue, we will need to look elsewhere in the region. Fr Frank Brennan SJ is Professor of Law at the Public Policy Institute, Australian Catholic University, and Adjunct Professor at the National Centre for Indigenous Studies, Australian National University. The Government and the opposition are right in trying to find a way to make illegal migration using people smugglers a less attractive alternative. A typically fair and thoughtful article, Fr. Brennan; thank you. I hope it is to be published in the wider press. But I wonder why you haven't mentioned our own responsibility to build more(and humane)centres for asylum seekers so they can be processed on our own land, and as swiftly as possible? We have a real duty of care here,not only to these people but also to the hapless 'off-shore'countries we're shamelessly pressuring. Thanks for a clear, informed, balanced view on a complex issue. We all need to let our political leaders know that short term fixes that do not take into account the needs of asylum seekers or of neighbouring countries are not good enough for Australian voters either. Here's a thought for 'moving forward' - in fact a 'great leap forward'. How can we take the pressure off our regional neighbours, establish our bona fides as a humanitarian and generous society, embrace our responsibility to those whose lives are threatened in ways we can hardly begin to understand? It's simple really. Set up a Regional Processing Facility right here in Australia. We've got the room, we've got the money, we've already built half the facilities, we've got the people prepared and qualified to run it. It's an offer Tony Abbott can't possibly match. Go for it Juliaa! I presume 7 includes provision for independent investigation of what happens to returnees. There is actually a solution to end people smuggling and discrimination against law-abiding refugees trying to enter Australia legally. The Government should in coordination with the Governments of Pakistan and India create and or support local assessment centres. These centres could be financially supported by our Government but would be under UNHCR mandate. People using the services of people smugglers would be returned to these centres and assessed on equal footing with other refugees. This would make a dangerous trips by boat unnecessary. Beat, there are no illegal migrants and nor are there any people smugglers. Detention is not required, we now are locking up Afghans in breach of our own laws on the illegal and bogus claim that Afghanistan is getting better when it is not. For anyone to suggest this can be done on a regional basis flies in the face of the refugee convention which states that signatory states assess claims of arrivals and in Australia one criteria for applying for protection is that they have to be in Australia. Stopping anyone getting here flies in the face of the right to seek asylum, trying to stop them at source as Gillard thinks is good flies in the face of the right to escape persecution. In short Australia has been in breach of their own laws for so long we have forgotten what those laws are while we babble endlessly about silly points of "policy". Beat, Everyone has the right to seek asylum, full stop. They don't need papers, there is nothing illegal about arriving without papers, or paying for transport. The UNHCR does not process refugee applications except in emergencies and as we have been paying them in Indonesia for the past 15 years without accepting those we illegally place on that queue. Once registered with the UNHCR, many refugees seek resettlement to a country such as Australia. Refugees do not have a right to be resettled, and states are not obliged under the 1951 Refugee Convention or any other instrument to accept refugees for resettlement. It is a voluntary scheme co-ordinated by the UNHCR which, amongst other things facilitates burden-sharing amongst signatory states. Resettlement therefore complements and is not a substitute for the provision of protection to people who apply for asylum under the Convention. Can you tell me that if Australia is the most attractive of nations in which to seek asylum - why is it that refugees do not assimilate with Australians and moreover, do not want to be Australians other than to use our resources. It may be christian and humane to accept whoever knocketh on our part, but what is the intention of the refugee because from what I have observed is that refugees and migrants on the whole, do not assimilate into our way of life. One only has to look at the numbers of refugees and migrants who attend National services like Anzac Day, etc. Fair's fair. Australians deserve something in return for asylum, values such as loyalty and respect for our religion and integration and security. This is what they are offered. If Caravaggio hadn't been such a drunken, violent, criminal, he may never have been human enough, disturbed enough or repentant of enough sin to produce the most arresting, influential and remarkable sacred art in the history of the Christian West.